You can install Insider Preview builds on individual devices, manage installation across multiple devices, or install on a virtual machine. NOTE: A device must be running a licensed version of Windows 10 to update to an Insider Preview build. Register as a Windows Insider if you haven't done so already. See Register. On the device, Diagnostic Data settings must be set to Enhanced or Full to receive Insider Preview builds. To check and change settings, go to Settings>Privacy>Diagnostics & feedback. You can also use the Registry Editor to manually set the diagnostic data level. Open Windows Insider Program settings. You can find the settings by going to Start > Settings > Update & security > Windows Insider Program. To see this setting, you must have administrator rights to your device. Click Get started and follow the prompts to link your Microsoft or work account that you used to register as a Windows Insider. Sign-in using the account you used to register for the Windows Insider Program. Under “What kind of content that you would like to receive”, select active development of Windows to receive Insider Preview builds and click Confirm. Select “Fixes, apps and drivers” if you want to install builds from the Release Preview Ring. Under “What pace do you want to receive preview builds” select Fast if you would like to receive the latest Insider Preview builds. If you prefer to wait for a more stable build, select Slow. Click Confirm. Review the privacy statement and click Continue. 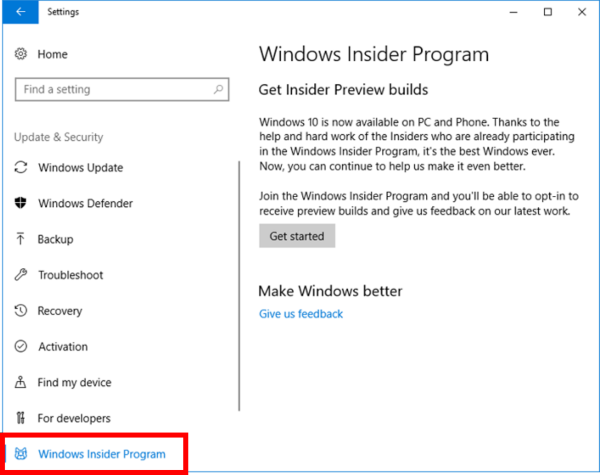 To immediately download the latest Insider Preview build based on the criteria you selected, go to Start > Settings > Update & Security > Windows Update, and click Check for updates. Once the download is complete, reboot your device again to complete installation. Administrators can install and manage Insider Preview builds centrally across multiple devices in their organizational domain using Group Policies or MDM Policies. This option requires an Azure AD domain which must be registered in the Windows Insider Program. For instructions, see Manage Windows Insider Preview builds. You can run Insider Preview builds as a virtual machine on a PC in Hyper-V. This option enables you to run Insider Preview builds without changing the Windows 10 production build already running on a PC. To download the latest Insider Preview build ISO file to run on your virtual machine see: Windows Insider Preview downloads. These tips will help you and your organization get the most out of Insider Preview builds and the Windows Insider Program for Business. Check to ensure you have the latest build version. Once you have installed an Insider Preview build, the version number will appear in a watermark on the lower right corner of your desktop. You can also confirm the Insider Preview build version installed by going to Settings>About your PC and scrolling to "Windows Specifications". To confirm that you have the latest Insider Preview build version, check our Flight Hub. *Not getting Insider Preview builds? Check our Troubleshooting Tips to ensure that your PC is able to install the latest Insider Preview build throuh Windows Update. Provide us with feedback. To help us shape Windows to address your organization's specific needs, submit feedback on Insider Preview builds directly to the Feedback Hub in Windows. See Submit and track feedback uisng the Feedback Hub. Use Insider Preview builds to accelerate your next Windows deployment. Validating your apps and infrastructure on Insider Preview builds can play an important role in your Windows 10 deployment strategy. See Working with Windows 10 Insider Preview Builds. You can also use Windows Anlytics to monitor device health and issues. See Using Device Health to monitor Insider Preview builds. Join our community. Join our Windows Insider Tech Community to share and learn from other IT experts. Windows 10 Insider Preview Builds are available in the following SKU languages: Arabic (Saudi Arabia), Bulgarian (Bulgaria), Chinese (Simplified, China), Chinese (Traditional, Taiwan), Croatian (Croatia), Czech (Czech Republic), Danish (Denmark), Dutch (Netherlands), English (United Kingdom), English (United States), Estonian (Estonia), Finnish (Finland), French (Canada), French (France), German (Germany), Greek (Greece), Hebrew (Israel), Hungarian (Hungary), Italian (Italy), Japanese (Japan), Korean (Korea), Latvian (Latvia), Lithuanian (Lithuania), Norwegian, Bokmål (Norway), Polish (Poland), Portuguese (Brazil), Portuguese (Portugal), Romanian (Romania), Russian (Russia), Serbian (Latin, Serbia), Slovak (Slovakia), Slovenian (Slovenia), Spanish (Mexico), Spanish (Spain, International Sort), Swedish (Sweden), Thai (Thailand), Turkish (Turkey), Ukrainian (Ukraine). Windows 10 Insider Preview is available in the following Language Interface Packs (LIP) languages: Afrikaans (South Africa), Albanian (Albania), Amharic, Armenian, Assamese, Azerbaijani (Latin, Azerbaijan), Bangla (Bangladesh), Bangla (India), Basque, Belarusian (Belarus), Bosnian (Latin), Catalan (Catalan), Cherokee (Cherokee), Dari, Filipino (Philippines), Galician (Galician), Georgian, Gujarati, Hindi (India), Icelandic, Indonesian (Indonesia), Irish, Kannada, Kazakh (Kazakhstan), Khmer (Cambodia), KiSwahili, Konkani, Kyrgyz, Lao (Laos), Luxembourgish, Macedonian (Former Yugoslav Republic of Macedonia), Malay (Malaysia), Malayalam, Maltese, Maori, Marathi, Mongolian (Cyrillic), Nepali, Norwegian (Nynorsk), Odia, Persian, Punjabi, Quechua, Scottish Gaelic, Serbian (Cyrillic, Bosnia and Herzegovina), Serbian (Cyrillic, Serbia), Sindhi (Arabic), Sinhala, Tamil (India), Tatar, Telugu, Turkmen, Urdu, Uyghur, Uzbek (Latin, Uzbekistan), Valencian, Vietnamese, Welsh. LIP languages can be installed as a language pack over supported base languages.